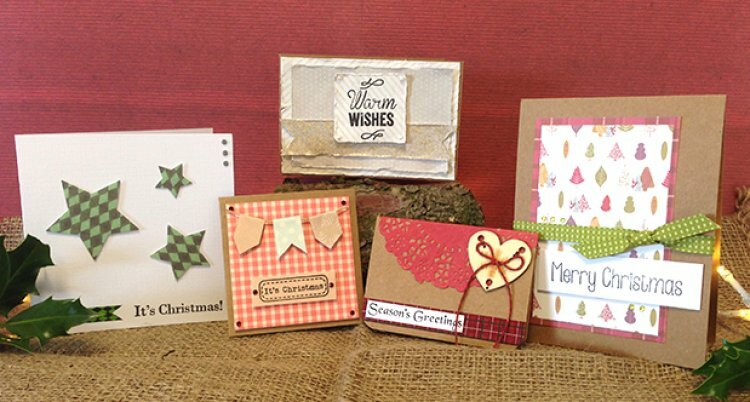 All these card projects can be made in under 5 minutes, perfect if you have a number of cards to craft this Christmas. Simple but striking this card is easy to replicate, for this card I have used Dovecraft 12 Days of Christmas paper and washi tape to add a bold design. Cut a rectangle of white textured card to 25 x 12.5cm, score and fold into a card blank. Punch three stars of various sizes and glue down using silicon glue to add depth. Stamp your sentiment in the bottom right corner and finish with gems and a washi tape strip. Top-tip: If you want to post your cards, keep them flat and lightweight. Postage is expensive. I love the new Dovecraft Krafty Christmas papers; they have a great Christmassy feeling with a modern touch. To make this card I have simply cut a piece of red gingham paper to 8x8cm and stuck it on a mini card blank using foam squares. I then cut 3 pieces of bunting , folded them in half and stuck them down on brown raffia using foam squares. I then stamped the cute It’s Christmas sentiment, cut it out and fixed it to the card. To add a bit of sparkle I embellished with festive red gems. There is something very festive and glamorous about the new First Edition Gilded Winter papers, the golden muted colours combined with the glitter effects is perfect for my card design. I cut a 5x7 kraft card in half, this way you get 2 cards out of your one card blank. Using the striped paper cut to 12.5 x 8cm I distressed the edge with my knife, I repeated this on the polka paper layer cut to 11x 7cm. Cut a piece of the glittered card to 12 x 2.5 and trim the ends to flag points, distress and fix to the card. Stamp your sentiment on the striped card, trim around, distress then glue down to the centre using foam squares. Finish with a pearl in each corner of the sentiment. Top-tip: Try not to use too many wet products like ink, glue, and glitter on your cards as you will be left waiting for them to dry. I love the festive warm red tones in this year’s collections and wanted to combine them into this year’s Christmas cards. I used a mini kraft card with the corners rounded off. I layered a red doily over the top of the card and added a strip of tartan washi tape to the bottom of the card. I cut a length of twine and made a bow before gluing this to a wooden heart and fixing in the top right corner. I finished my card by stamping a sentiment and sticking it on top of the washi tape. This card is very simple to make but has a lovely festive edge with the tartan and the green ribbon. I made this card using a 5x7 Kraft card. Cut a piece of Me to You tartan paper to 8 x 13cm and layer with the tree print paper cut to 7.5 x 12cm. Wrap a length of green ribbon tied with a bow across the front. Finally stamp your Merry Christmas on white card and cut out leaving a nice border, stick under the ribbon using foam squares. Add a few green gems to add a Christmas sparkle. Top-tip: Try not to over complicate your cards, people will appreciate your hand made efforts so don’t make them too time consuming to make. We have plenty more Christmas projects coming up over the next few weeks, why not let us know below which your favourite card is above and why! Don’t forget to check out all our Christmas makes in the Official gallery.